Prime Niagara Falls Studio Apt - Walk to Falls! Delight in the grandeur of America’s first state park when you stay at this vacation rental studio in Niagara Falls. 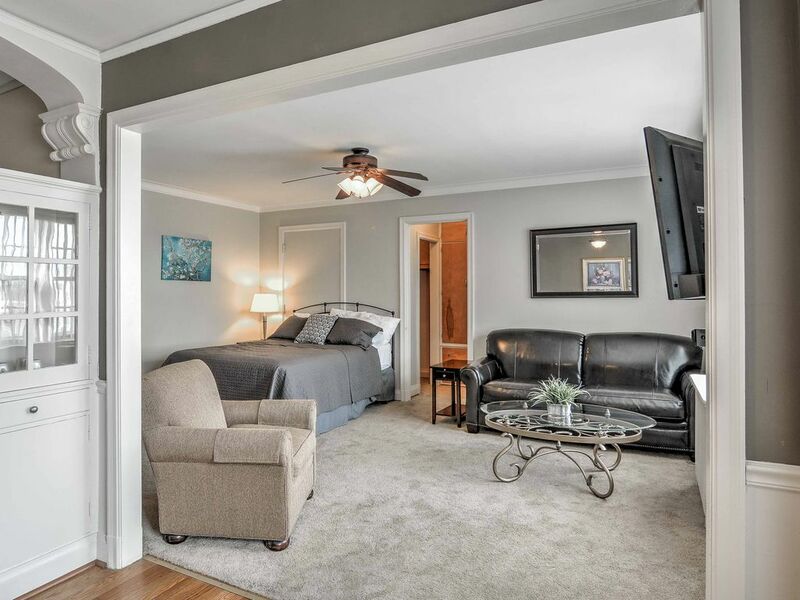 This apartment provides a central location ideal for businessmen, medical professionals, and upstate weekenders. Take a short 10-minute walk to the iconic falls and reserve a spot on the Maid of the Mist tour. Walk the bridges to the lush Goat Island, enjoy the games at Seneca Resort & Casino, dine at Third Street Retreat and explore downtown attractions during your next getaway! Built at the height of 'The Roaring Twenties,' The Jefferson is adorned with accents of art deco architecture and historic appeal, visible right as you walk in the grand lobby! Plenty of natural light and decorative wall molding welcome you inside the studio. Kick back on the leather couch in front of the flat-screen cable TV as you connect to the complimentary wireless internet. Walk around the corner to find the well-equipped kitchenette that features warm hardwood floors and ample cabinet storage - perfect for preparing all your vacation meals! Enjoy your home-cooked treats at the cozy bistro table set for 2. You can also walk down to the building's first floor for breakfast or lunch at Third Street Retreat! Freshen up before bed in the full bathroom that features sleek subway tiles and a shower/tub combo. Get a good night’s rest on the queen-sized mattress, so you’re ready for the next day’s outdoor adventure! This location is ideal for traveling nurses since the Niagara Falls Memorial Medical Center is just 5 minutes away. Businessmen will also benefit from this studio's location since Buffalo, Niagara University, St. Mary's Hospital, Niagara Falls Memorial Hospital, Niagara Falls Air Force Base, the culinary institute, The Outlet Collection at Niagara, Art Park, and Niagara Power Vista are within an easy drive. Follow the roar of the waterfalls 10 minutes down the road where various attractions eagerly await. Book a tour on the famous Maid of the Mist, walk to the Observation Tower or venture down onto the platforms at the Cave of the Winds. Skip the poncho and take a walk along the pedestrian bridge to Goat Island that offers panoramic views of both Bridal Veil Falls and Horseshoe Falls. Share the views over a savory appetizer at the Top of the Falls restaurant, or explore the adjacent Three Sisters Islands for a unique perspective of the upper rapids. Experience a bird’s eye view of this magnificent terrain when you book a private helicopter tour with Rainbow Air, Inc. This excursion is sure to be one for the books! Enjoy the nearby nightlife at Seneca Resort & Casino, Wine on Third or The Craft Kitchen & Bar - all within a 5-minute walk from the studio! Attend a must-see concert before heading down Old Falls Street to view the colorful illuminations projected onto Niagara Falls. - Amenities include a well-equipped kitchenette with a stovetop and oven, free Wifi, flat-screen cable TV, on-site laundry facilities, free parking, and more! - Premier Niagara Falls location - Situated a half mile from the falls, walking distance to Seneca Niagara Resort & Casino, the bridge to Goat Island, Maid of the Mist Boat Tours, Conference Center, restaurants, shopping, and many other attractions! The efficiency apartment served its purpose. Close to casino and strip of restaurants. Residents of the building were either annoyed or friendly in passing. As others have commented, the building and furniture are worn but it does have character. Enjoyed our stay at Niagara Falls. Only stayed two out of the three days as the weather was very humid. Property was clean but smaller than anticipated. Was able to use the Refrigerator but kitchen was very small and did not use it to cook meals. Also thought there would be a washer dryer in the unit and there was not. Next time will probably stay at a motel on the Canadian Side, seemed to spend most of our time over the border as the view was nicer. The check-in process was easy as described in the mailed instructions, which was much appreciated. When we arrived, we did encounter an issue with the bathroom sink, but after calling the office, a maintenance person stopped by within a couple of hours to fix it. The building itself is a bit older, which you do notice, and some of the furniture is well-worn. However, it was clean and comfortable, and it served as a great jumping off point for all of our activities in Niagara Falls -- we were able to walk everywhere we wanted. Perfect walking distance from the falls! We were disappointed by several things while staying at the Jefferson. There were two women in the office when we arrived. One was very nice and helped us gain entry, however the other never acknowledged us even though we saw here on several different days working in the office. She was rude, we even passed her as she sat outside on a bench by the door smoking and she did not even make eye contact. The room was ok, it served the purpose, but was not super clean and the ac was small window unit that never cooled the room so that sleep was comfortable. I would not recommend this building. Niagara has beautiful natural wonders but the city itself is very rundown. We had tremendous difficulty finding a restuarant that was not a chain, the town ids a food desert. Nice location in regards to Niagara Falls, NY, Goat Island, and the other local attractions. The place was clean, and as advertised.